Review written by and copyright: Eric Cotenas (8th February 2019). The Haunted Castle: A weekend hunting party at the castle of Baron Von Vogelschrey (Diary of a Lost Girl's Arnold Korff) is the setting for intrigue when the ostracized Count Johann Oetsch (Lothar Mehnert) shows up uninvited. Having spent the last several years in India after being accused of shooting his brother Peter (The Longest Day's Paul Hartmann) to become sole heir, Johann brings with him the Eastern gift of prophecy. When a guest (The Oyster Princess's Julius Falkenstein) glibly asks if any of the party will manage to get off a shot during this rain-drenched weekend, Johann answers: "A shot will be fired… maybe two." With Peter's widow, now the Baroness Safferstätt (Moulin Rouge's Olga Tschechowa) having wed Peter's best friend (Two Merry Adventurers' Paul Bildt), due to arrive, the Vogelschrey and his wife Centa (Lulu Kyser-Korff) are eager to spare the Baroness pain. Upon learning of Johann's presence, the Baroness wants to leave until she learns that Peter's distant relation Father Faramund will also be arriving after spending the last decade in Rome. The Baroness is eager for him to take her confession. Johann's statement that he only hunts in wind and rain turns out to be no mere quip when he sets out alone in the rain the next day. When Father Faramund arrives, the Baroness tells him of her marriage to Peter which was once blissful until he returned from a trip thoroughly engrossed in spiritualism, attempting to live a saintly life and insisting the same of her. It was when he decided to give away all of their material possessions that the brothers quarreled violently the night before Peter was murdered. The Baroness is too upset to continue her confession and begs that he return to her the next day. That night, the priest vanishes into thin air and Johann returns. The guests, lead primarily by the retired provincial judge (The Woman in the Moon's Hermann Vallentin) come to believe that Johann has done away with the priest, but Johann suggests that the Baron Safferstätt has more experience with murder than himself. Safferstätt is unsettled by Johann's accusations, but Johann is caught equally off-guard when the Baroness confronts him in front of the guests and accuses him of murdering her previous husband. The hunting party think they are well rid of a double murderer when Johann vanishes; but then, Father Faramund reappears alive and well to hear the rest of the Baroness' confession. Coming just before director F.W. Murnau's more celebrated Nosferatu, The Haunted Castle is no expressionist horror film. While its plot sounds like a standard melodrama, and its climax certainly is fitting of one, the film actually offers some deft social commentary about the sort of polite society, the depiction of whose leisurely activities from which postwar audiences might looked for escapism. Based on a novel by Rudolf Stratz (filmed once more in 1936) and adapted by Carl Mayer (The Cabinet of Dr. Caligari), Johann's machinations are predicated on the good manners of his host not to throw him out even though the beliefs about his guilt shared by the guests are presumably also those of German high society en masse. When Johann directly insults Safferstätt, the retired provincial judge can only chide him by reminding him of social niceties before privately advising Safferstätt to confront Johann. The pomposity of this party of busybodies may exasperate the audience but ultimately pales in comparison to a confession late in the film that makes a hypocrite of what was the most sympathetic character, especially when the murderer seems to have suffered even more and is ultimately undone by their own sense of honor. There is some padding as the nightmare of one of the guests – which looks ahead to Murnau's immortal vampire film with an Orlockian clawed hand reaching through a window – is contrasted with a kitchen hand's dream of unfettered access to the opulent deserts prepared for the guests (after having been chased off by the chef in waking life for eating the whipped cream from the piping bag), but both these "lighter" sequences provide some relief from the gloom of the rest. Nosferatu's cinematographer Fritz Arno Wagner – co-credited with László Schäffer (Berlin: Symphony of a Great City) – is on hand, but the photography is less striking for its use of light and shadow and more for its symmetrical compositions – even the flashbacks do not make use of expressionistic touches – the nature of which is not always immediately apparent until a slight pan or a subsequent different camera angle reveals elements in the sets of Hermann Warm (Vampyr) that balance the left and right sides of the set and the shot; but it is the performances here that command attention in the frame (one can almost hear the dialogue spoken even though it is a silent film) and its highlighting of the hypocrisy of society is also engaging. The Finances of the Grand Duke: The Grand Duke of Abacco (Sumurun's Harry Liedtke) has inherited a small crown and a huge debt. The Duke exasperates his finance minister Esteban (The Wooing of Eve's Adolphe Engers) when he refuses an offer of ten million francs by businessman Bekker (The Stolen Face's Hermann Vallentin) who has discovered a deposit of sulfur at Hermosa Point because the Duke objects to the exploitation of his subjects who he encourages to live as leisurely as he. Salvation seems to come from the sky with the postman's delivery of a letter from Princess Olga of Russia (The Loves of Pharaoh's Mady Christians) who wants to marry him with the knowledge of his finances and promising her wealth to set them straight regardless of being forbidden from doing so by her brother Nikolai (Robert Scholtz). Insulted, Bekker plots with a quartet of conspirators – among them Nosferatu's Max Schreck – to foment revolution in the kingdom and run the Duke out of his kingdom. The Duke's happiness is short-lived when Olga's letter disappears and Esteban reveals that he took it to banker Markowitz (Guido Herzfeld) hoping for a reprieve from his debt collection only for the other man to keep it. Markowitz's criminal ways are also known to politician Isaacs (The Haunted Castle's Julius Falkenstein) who hires detective Philipp Collins (Phantom's Alfred Abel) to retrieve letters he wrote as a youth to a beautiful woman that Markowitz has been using to extort money from him. While searching for the letters, Collins finds Olga's letter and substitutes a forgery, returning to Isaaks and asking for a loan of fifty-thousand francs to speculate on the outcome of the Abacco revolution. As violence mounts, the Duke has left (not fled) the island in search of Olga while he is being accused to stealing from the kingdom's coffers. Collins helps a woman elude her pursuers. The woman turns out to be Princess Olga and her pursuers men sent by her brother. As they charter transport to Abacco which has been cut off from the mainland, with the unrecognized Duke in tow, will Collins help the Duke and Olga or seal the former's fate? Either way, he is sure to profit. Overlapping with the pre-production of The Last Laugh, the lightly comic The Finances of the Grand Duke – based on a novel by Frank Heller (filmed again in 1934) and adapted by Thea von Harbou (Metropolis) – seems quite unlike anything else in Murnau's extant filmography. It is somewhat difficult to fully assess since the only available version is a recut version that runs roughly half the reported length of the premiere – itself shortened but not to this extent a week after release – with claims that much of what was cut were digressions to the pictorial landscape and local customs (much like some of the footage shot for Nosferatu but only reinstated into the sound reissue The Twelfth Hour without Murnau's involvement) not entirely accounting for the presentation of the story which manages to come together in the viewer's mind but seems disjointed even as its act markers provide text that introduces the principal players as they appear in the progression of the story. Although Murnau does provide some criticism of venal capitalism – although accused of wasting the kingdom's money, the Duke is introduced literally tossing coins to his subjects while the man to which he owes money is unmasked as a usurer and extortionist – and the intrigues provide the potential for romance and drama, it is largely played as literally "sunny" comic adventure. Casual viewers may enjoy it for what it is while Murnau fans possibly put off by its failure to indulge in The Language of Shadows may still be stimulated by the ways in which it does and does not fit into Murnau's creative oeuvre. While an earlier source made the rounds on the bootleg circuit, The Haunted Castle was not restored until 2002 utilizing materials from the Bundesarchiv-Filmarchiv with tinting based on a nitrate print held by the Cinemateca Brasileira. The German intertitles are the original flash titles of the German source while some missing intertitles were recreated utilizing the original fonts. The standard definition video master from this restoration appeared on DVD in the US in 2009 from Kino International and the UK in 2011 from Eureka. Friedrich-Wilhelm-Murnau-Stiftung struck a new HD master of the restoration in 2013 which appeared on Blu-ray in the UK in 2016 in the boxed set Murnau: The Early Years. Kino's 1080p24 MPEG-4 AVC 1.33:1 pillarboxed fullscreen Blu-ray utilized the same master and it looks slightly darker than the SD transfers and Eureka's Blu-ray but also less saturated, this was true of the DVD editions with the UK looking warmer in its tinting, seeming like a deliberate adjustment on behalf of one of the companies. The digital tinting in both HD masters is more considered with regard to the available detail and textures, so it may be up to the user's preference unless they have been able to see the restoration theatrically or on German television to determine which is more accurate. The Finances of the Grand Duke was restored in 1994 by the Cineteca Italiana Milano, the Cineteca del Comune di Bologna, and the Münchner Stadtmuseum Filmmuseum and first appeared on DVD in 2009 in the United States from Kino International individually and in a boxed set and also in the United Kingdom from Eureka in a double disc set with Phantom. Although a high definition master has since been struck, the available materials and the state of film restoration in the nineties has resulted in a presentation that looks considerably rougher than The Haunted Castle or other Murnau restorations, with torn frames, scratches in various directions, and differential contrast suggesting more than one element used within some scenes with the HD restoration presumably attempting to faithfully represent the film restoration itself rather than utilizing digital cleaning and restoration tools. Once again, the Kino 1080p24 MPEG-4 AVC 1.33:1 pillarboxed fullscreen presentation looks a shade less saturated than the Eureka Murnau: Early Years presentation and it is down to personal preference for the two of them and otherwise take it or leave it for the actual restoration. The Haunted Castle carries over the Neil Brandt piano score from the Kino DVD with a bump up to LPCM 2.0 stereo while English subtitles accompany the German intertitles. The Finances of the Grand Duke carries over the Ekkehard Wölk score from the earlier DVD, also in uncompressed LPCM 2.0 stereo. Optional English subtitle accompany the German intertitles, although the intertitles here were apparently newly-created for the 1994 restoration without any attempts to mimic the originals or be in any way visually interesting. 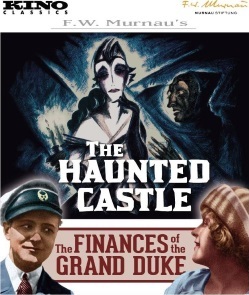 Extras are surprisingly sparse for a Murnau title, dropping the Kino DVD's excerpts from the source novel and set design drawings for The Haunted Castle but carrying over the audio commentary by film historian David Kalat from the Kino and Eureka DVD editions of The Finances of the Grand Duke. He concedes that the film is a bad fit with Murnau's better-known films but discusses the ways in which it shares common themes while also providing some interesting background on the production, from the location scouting and shooting to technical aspects of the film – noting the production's decision to paint light and shadows on the walls of the sets rather than fiddling with lighting instruments, as well as calling into question some of the information taken for granted about art director-turned-Poverty Row director Edgar G. Ulmer's (Detour) sometimes self-aggrandizing accounts of his work with Murnau during this period (while also noting some research that supports some of his recollections). Kino's Blu-ray pairing of two productions coming from either side of F.W. Murnau's lauded Nosferatu reveals the director stepping outside of "the language of shadows."